Why would Mr. Owens, the owner of a shopping mall living a comfortable life, feel the need to kill Mr. Ukulfaskul? What connects the two of them? The Chief Prosecutor is a busy man. I was expecting a long wait, but surprisingly it didn't take long for Edgeworth to let me into his office. Edgeworth began speaking the moment I sat down on the sofa. He sat at his desk, continuing to sign official documents as he spoke. ... I felt like I was being told to hurry up and leave already. I felt quite unwelcome. Well, not that I'd expect Edgeworth's office to be a welcoming place anyway. Edgeworth stated bluntly as he flipped through documents, not even glancing at me. Edgeworth knit his brow slightly. Good grief. So Ms. Cutter was a witness to the accident. I recalled the position Mr. Ukulfaskul's corpse was posed in. Owens had put the body into that pose after committing the murder. Edgeworth gave a surprisingly quick response to my mumbling. His phrasing was somewhat stiff, but Edgeworth's words embedded themselves deeply. Upon my return to the office, we all went out to the local burger shop. Apollo had quite an appetite worked up. Trucy made her order first. While we waited for the burgers, Trucy addressed me in an unusually formal manner. The case has been resolved, but Ms. Cutter's real trials are only beginning. With her father's cheating brought to light, society may start looking down on her. She may not be able to maintain her image as a bright and cheerful idol. Trucy picked up on my concern. Her expression became somewhat melancholy. On the screen was a close up of Ms. Cutter with a great smile. She had her knife in one hand and a melon in the other. Next to her was a dressed up table. As she sang, Ms. Cutter tossed the melon up in the air. Ms. Cutter flashed a smile and took a pose. Apollo murmured in a daze. The store's owner said, placing our burgers in front of us. Trucy, Athena and Apollo also paused. ... I see. Ms. Cutter's courage had grabbed him by the heart. It seems the match fixing scandal may have actually increased her fanbase. My bacon burger has a rabbit shaped apple as a topping! 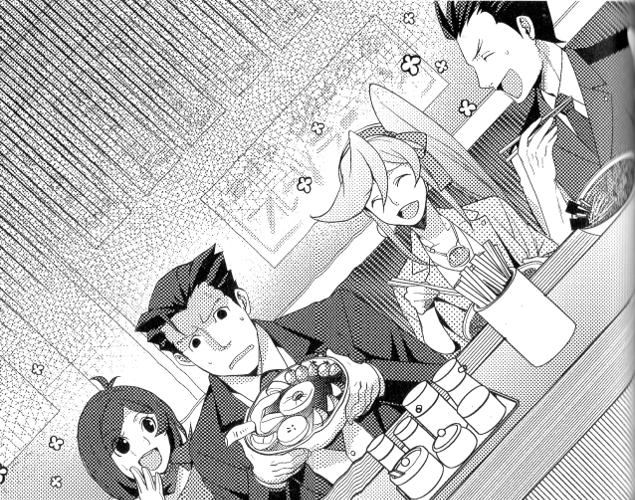 “My burger has a kiwi rose in it...” Trucy said. “I've got a heart shaped strawberry!” Athena added. “I've got a baby chick made of... pineapple.” Apollo responded. ... Maybe I'd be happy if he'd carved a pickle instead.